It took less than five minutes for Emmy to tip-toe out of her room after I had put her to bed. “I can’t sleep!” she exclaimed. “You’ve barely tried,” I told her as I put her back in bed. I love seeing her excitement over the days to come. She is so cute, and she makes me remember how excited I was as a kid, counting the days down to Christmas. I love seeing my daughters decorate the Christmas tree. I love the lights shining in the snow. I love hearing the Salvation Army volunteer ring the bell. I love shopping for presents. In just a couple of weeks, I’ll be tired of the Christmas tree hogging the living room, and it will be time to put it away. There will be no more Christmas music at the mall, and our neighbors will take down their lights that shine in the snow. The torn wrapping paper and ribbons will be thrown away. All the wonderful things that “make the season bright” will be gone…except for the most important gift. Jesus, the gift of Christmas, will still be with us. What do you think? Is it the most wonderful time of the year? Link up below or over at Second Blooming! Your blog post will be linked on both our blogs! Link your Most Wonderful Time blog posts here! I always love this time of year because I get to see my family! I wish I got to see them more often! Thank you for remembering the Christ in Christmas! Last night was Jude’s school Christmas pageant, and listening to all those sweet little children sing songs about Jesus made me a weepy hormonal woman mess. The 1st and 2nd graders sang this – http://www.youtube.com/watch?v=dBSZJ8CYUEs , and there wasn’t a dry eye in the house. And thank you for being my Spin Cycle partner! I couldn’t ask for better! Merry Christmas to you and yours! The Christmas concerts at my old Catholic schools used to make me weepy, too. Just listened to that song you linked to. Oh yeah, weepy now! 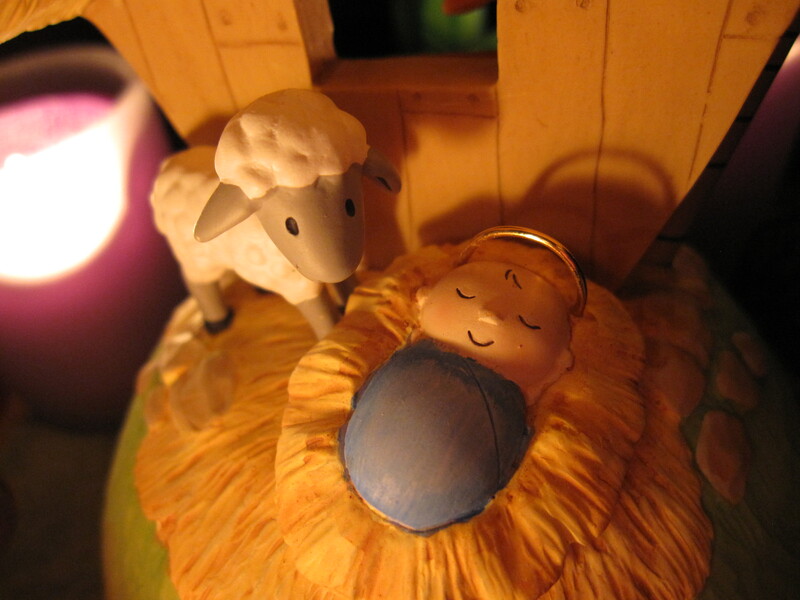 What a lovely post……..Jesus is the reason for the season! It’s definitely one of the most wonderful times of the year! I really love spring/summer when Des, Scarlet and then I have our birthdays. tamaralikecamera recently posted…Can I Really Do This? Love your post about the excitement of the girls. Completely agree with what lingers. I have a penguin nativity with the baby on the mom’s feet. Merry Christmas and thanks for accepting a senior citizen into you circle of bloggers. Loved your post. My feelings, exactly. And I have a penguin nativity : ). Merry Christmas, Ginny Marie. Thanks for allowing a senior citizen into your circle of bloggers. That was a wonderful post! I love to see my kids still get excited for Christmas. My youngest, 16, is still really like that. I hope he never grows out of it! Yay! Crazy is definitely the word for it. My kids were going crazy before school this morning! It’s their last day before winter break.